I am honored that Pat from New Bloggy Cat has agreed to share a post with my readers. Enjoy! P.S. : I can’t decide which of the critters she writes about is my favorite. Do you have a favorite? CookieCakes from the lovely blog, Cordelia’s Mom Still, asked if I would be interested in doing a guest post about my human’s pet ownership experience. I am, of course, delighted! Well, how often does a cat get a request to write a guest post? But it took me a while to get this post ready. I eat and sleep too much. And my stubby paws are too clumsy on the keyboard. My human, Pat is a huge fan and lover of animals since she was a little girl. Pat grew up mostly with dogs, and there were a few dogs that were fondly remembered by her. I managed to dig into some (sneeze! sneeze!) dusty old files. Ah yes, here it is – the ‘Pooch file’. 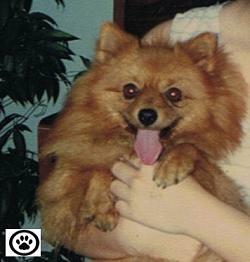 Pat was about nine years old when Tiny gave birth to puppies. And for some reasons, Tiny was not interested to nurse her own pups. So, Pat went to the sundry shop situated about 100 metres from her house and bought a bottle teat (the one that looks like the lamb bottle teat). She then fixed the teat to an empty bottle and fed the puppies. It was a long time ago, and that was the most vivid memory of Tiny. Pat’s aunt gave Rollie to her when she was 11. He was a fluffy plump dog. He was also very obedient and made a wonderful companion, especially during Pat’s teenage years and the rough patches in her life. Pat’s dad had a brain injury when she was 15 and due to the delay in surgery, he was half-paralyzed. And with the lack of support/ physiotherapy sessions, he did not regain use of his left hand and leg. 15 years later in mid-2000, her dad was diagnosed with cancer of the esophagus, and he passed away 6 months later in early 2001. I was obviously not one of Rollie’s buddies because he could not stand the sight of cats. But I was happy for Pat to have had such a loyal companion. Rollie died in 1996 when he was 15 years old due to old age. Zico was delightfully gorgeous and frisky. Pat loved the way Zico jumped on her bed and licked her face in the morning to wake her up for school. 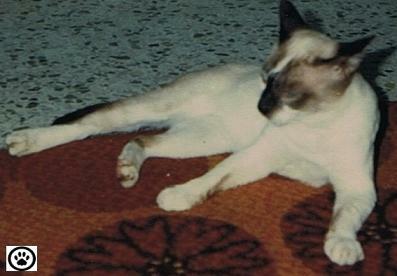 At about the same time Zico was born, Pat brought home a mixed Siamese kitten, Yo-yo. Zico and Yoyo used to play and sleep together on the sofa. It was a joy to see them together. 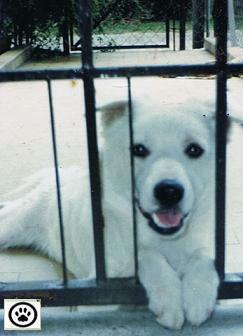 But sadly, Zico died suddenly when he was barely a year old when Pat was 16. I missed this little fella too. He was such a fun-loving dog. Mylo came to live with Pat shortly after Rollie died. He was no wimpy dog. He was an excellent guard dog and a great hunter. In fact, he had caught more mice than I did (no kidding!). Each time he killed a mouse he would sit in front of the lifeless creature and watch it with his life. But, I think he did that to make me feel bad. And I got the feeling, around him, that I was being tolerated. Once Pat bought a green coconut and left it on the porch. I watched Mylo in astonishment as he bit the green shell/husk out vigorously. Then he tossed the coconut like a football many times until it cracked open. And he took his time to savour the delicious fruit. Mylo died in 2006 due to kidney failure. He was 10 years old. Pat and her hubby adopted Monster when he was about 6 months old. He was affectionate, zippy and goofy. He would gnaw anything and everything, including his male human’s sunglasses and Ericsson phone. And that was how the name “Monster” got stuck. He was athletic too. He loved to play fetch, football and Frisbee. Just say the word “ball” and he would get all spirited. And he loved to play hide and seek with the girls. 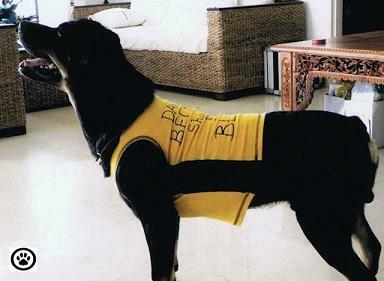 Monster was an all-rounder and had had many fond memories with his human family. And he knew it was time to go, and he said goodbye to his human family on 2nd October 2014. It took Pat and hubby a while to get over Monster’s passing and only until July 2015 did they decide to adopt another dog. But sometimes, finding the right dog can be a bit tricky. 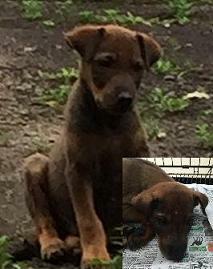 He was an abused puppy but the volunteer (Ms T) who advertised in ‘Petfinder’ said it was a 3-month old Belgian shepherd mix and posted a fuzzy photo of him. He looked nothing like a Belgian Shepherd. He was scrawny and had a big maggot wound on his left rear thigh when Ms T brought him to Pat’s home. The animal shelter was overcrowded, and Ms T asked Pat to consider giving this puppy a home. (And there I was in the background, making a fool of myself trying to do my cat-signal to tell Pat not to adopt this puppy). But Pat was not paying attention. So, the puppy stayed, and Ms T said his name was Dusty. He looked more like ‘Rusty’ to me. A maggot wound at this age? The wound stitches were about 3 inches long. He was very fearful, hid in the corner the whole day and howled at night. To cut the long story short, Dusty was returned to Ms T in less than a week. With Whisky, Pat thought she had finally found the right puppy. The puppy’s mother is the guard dog in a small shoe factory about 45 minutes from where she lives. When Pat saw the 2-month old puppy, he looked alright. And Pat told the puppy’s owner (Ms N) that she would collect the puppy in about a month’s time as the puppy was still feeding on breast milk. 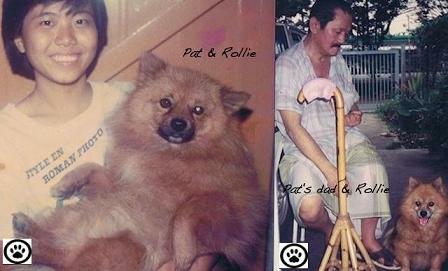 In mid-September when Pat collected the puppy, Ms N wrapped a towel around the puppy before handing over to Pat. Only in the car, did Pat realize that the puppy had lots of fleas on his paws and ears. Pat gave him a good wash, fed him and did all the things a good pet owner would do. 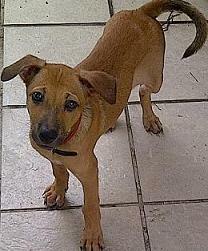 But as the days went by, the puppy became more aggressive with Pat’s daughters, aged 4 & 9. He would jump on them and bite/pull their dresses. So, finally Pat and her hubby decided this puppy would not be suitable for the girls, and Whisky had to be sent away to the animal shelter. Pat said that it was not an easy thing to do, but sometimes it is the right thing to do before the situation gets out of control. Pat got to know about Fire through Ms C. Ms C said her friend was sheltering a stray that had given birth to 8 puppies and asked if Pat would be interested to adopt one. 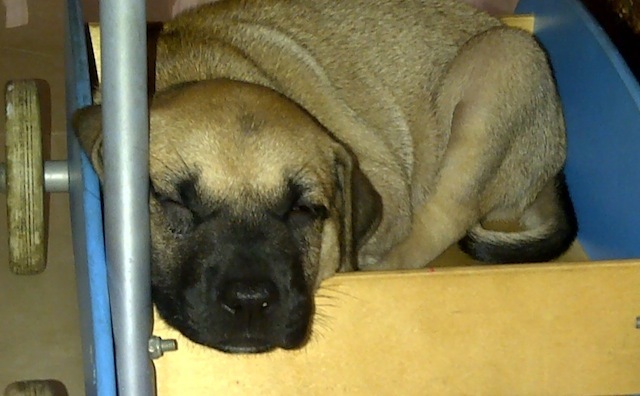 He was such an adorable puppy and out of the litter, he was the odd one, and he looks like a Mastiff. Pat’s girls simply adore him, and I think he is fitting in pretty well. The only thing that still puzzles me is why the name, Fire? Well, I suppose any intruders will be fired out immediately. Pat adopted Yo-yo, a cross-eyed Siamese mixed when he was a little kitten. He was intelligent, sociable and playful. Yo-yo and Zico were best of friends when they were young. But unfortunately, Zico died when he was a year old. Yo-yo then started to go out a lot during the day and only came home for dinner. One day in 1991, Pat received a call from her mom that Yo-yo was badly bitten by a stray cat. And he had a really bad wound below his left ear. At that time, Pat was away in college, which was about 2-hour drive from her hometown. Back at home, Pat’s mom managed to get her friend who was a veterinarian technician to help Yo-yo but it was not enough to save him. Pat would normally travel home by bus for the weekend to visit her parents. And on that sad Friday night, she got home just in time to say goodbye to Yo-yo. Humans are truly blessed to have such wonderful four legged companions to help them understand the meaning of life. Pat had learned from Yo-yo and I how to live independently, ignore what others think about you and to do what you love doing, like sleeping and eating the whole day. And from her beloved Tail-waggers (only those with the ‘paw print’ on the photos) how to love unconditionally, forgive quickly, live peacefully, be faithful, listen attentively, shake off the lies and be happy always. “Animals don’t lie. Animals don’t criticize. This entry was posted in Guest Posters, Pets, Relationships, That's Life and tagged cats, Cordelia's Mom, dogs, New Bloggy Cat, pets. Bookmark the permalink. They all seem like winners to me. I think I might go with Rusty. I love a survivor. I’d like to have every one of them. You’re very welcome. 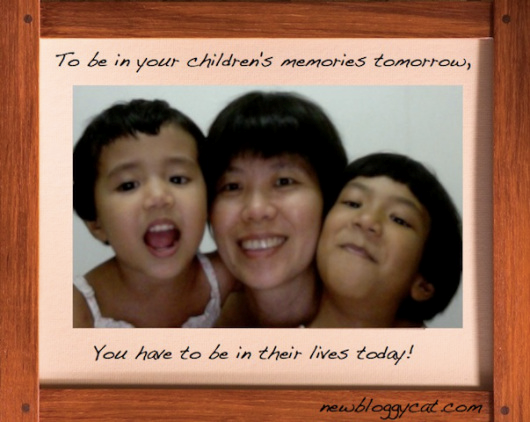 You may guest post for me any time! Pets are special. Want unconditional love? Get a dog or cat. I hear you. My youngest is about to move from an apartment into her first house. All she can talk about is that now she can get her own dog. I’m looking forward to helping her pick one out, ’cause you know, I’ll be taking care of it at times, too.